April 23: To register click here. Join Frank Mantlik, expert birder and Coastal Center Regional Board member, for an early spring bird walk along Milford Point. Please bring binoculars and spotting scopes, if you have them. Appropriate for adults and teens 16 and up. Registrants will be notified if program is cancelled for inclement weather. Please dress warmly. Eggs come in all shapes and colors. Some are blue and some are speckled, some are the size of your thumbnail while some are the size of your whole palm! Explore the biology and beauty of eggs and their colors. Experiment with natural dyes made from every day kitchen materials like beets, turmeric and cabbage. 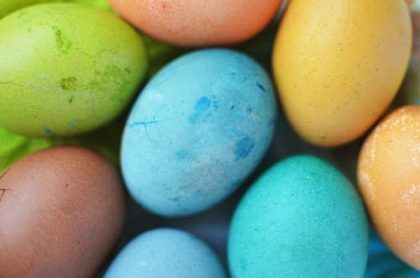 Take home some colored eggs and the easy-to-create recipes for further color experiments. Each participant will be able to dye 6 eggs. These eggs will be hard-boiled but are not edible. All ages welcome! 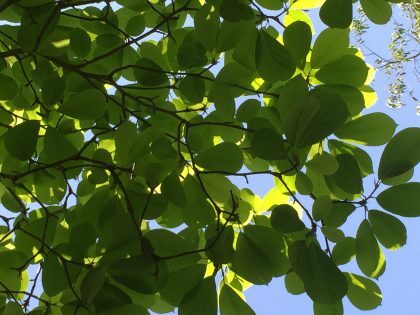 We know the saying “April showers bring May flowers!” But, what’s so important about water? Come to the Coastal Center to learn about this important resource. Play the water cycle game, experiment with rainfall on the watershed models, and build your own rain gauge to take home and record your local spring showers. It’s going to a sense-ational day! discover more about our own senses and those of the animals that call Long Island Sound home. We’ll use our sense of sight to look around and then use a magnifying glass to explore the world of tiny things. Listen for sounds of nature and learn basic bird calls. Discover how lobsters use their sense of smell to find food as you play “smell-o-rama.” Compare the way hermit crabs use their sense of touch to ours a we identify mystery objects. For Troops, Individuals with Adult. Fee: $14/girl; $2/adult. Badges are not provided. Explore the marsh and beach as we investigate the diversity of animals and their adaptations to life in coastal habitats. Through the use of microscopes and hand lenses, get an up-close look at some of the animals that call Long Island Sound home. discover the unique challenges that animals face when creating homes along the coast. For Troops, Individuals with Adult. Pre-registration required. No walk-ins permitted. All registrations must be made through the Girl Scout website. New to birding? This walk is for you! Learn basic field marks and other identification clues and how to use binoculars. We’ll visit the marsh, beach and upland areas of the Coastal Center in search of the birds that are here this time of year, including our resident Osprey pair. Please bring binoculars if you have them or you may borrow a pair from us. This is a Migration Madness event. 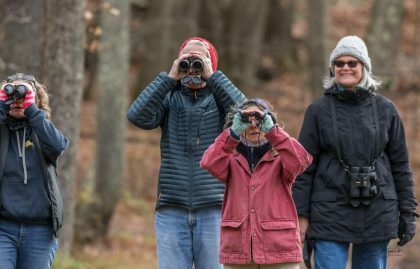 Migration Madness is Connecticut Audubon’s statewide celebration of the birds of Connecticut. Click here for more information and be sure to download our flyer. Join Frank Mantlik, expert birder and Coastal Center Regional Board member, for a walk along the marsh, beach, and upland areas of the Coastal Center to view the birds that are here this time of year. Please bring binoculars and spotting scopes, if you have them. Appropriate for adults and teens 16 and up. Registrants will be notified if program is cancelled for inclement weather. Everyone loves a scavenger hunt! We’ll explore the habitats of the Coastal Center in search of birds and their behaviors to complete your Bird Bingo Scavenger Hunt. Where will we find the most birds? What birds will we find? Take action to make your kitchen eco-friendly! Put the plastic down because reusable beeswax wraps are what you’ve been looking for! This kitchen game changer can be used to cover a bowl or platter meant for the fridge or when headed out the door, they are great for snack filled lunchboxes and any other role plastic wrap used to fill. Spend an afternoon at the Coastal Center to create your own set of 3 reusable beeswax wraps. Materials are provided! Appropriate for adults and families with children 10 and over. Project Limulus researchers from Sacred Heart University will share information about this ongoing research and monitoring program studying horseshoe crab ecology in Long Island Sound. The program will begin with a brief introduction and information session indoors, then will head to the beach in search of horseshoe crabs. Participants should wear shoes or rain boots that can get wet and sandy; we will be walking out along the beach. We also suggest a hat and plenty of sun-block too. Did you know that Connecticut Trails Day is the largest Trails Day Celebration in the country? Trails Day is organized by The Connecticut Forest & Park Association and the Coastal Center is pleased to join the Trails Day fun by hosting this event. To register click here. This link will take you to The Connecticut Forest & Park Association website. All registrations must be made through their website. Visit the Connecticut Forest & Park Association website for more information and events. Detritus! What in the world is that? The salt marsh on site at the Coastal Center is your lab to learning about detritus and the critters that feast on this key component of the ecosystem. Explore fiddler crab tunnels and spend time catching and releasing these crabs. Nets and buckets provided. A little marsh mud is to be expected so be sure to wear rain boots or shoes that can get wet and muddy! The more mud, the merrier! All ages welcome. Look no further! CAS’s Coastal Center at Milford Point is the perfect place to hold your child’s next birthday party! Our staff has designed a wide range of “theme” parties to provide your child and their friends with a memorable and fun hands-on learning experience. Click here for our brochure. Call 203-878-7440 for details. Our updated scouting programs are 60-90 minutes long and are designed to help scouts earn their badges and learn about the environment. Click here for our brochure on Girl Scout programs. For our Cub Scout brochure, click here. Call 203-878-7440 for more information or to book a program for your scout today! Smith-Hubbell Wildlife Refuge and Bird Sanctuary is open daily, year-round, from dawn to dusk.